Update 18 April 2019: The Hyatt website now makes it a lot more obvious that the Andaz West Hollywood charges and unconscionable ‘Destination Fee’ – the Andaz’s own website is as opaque as ever. 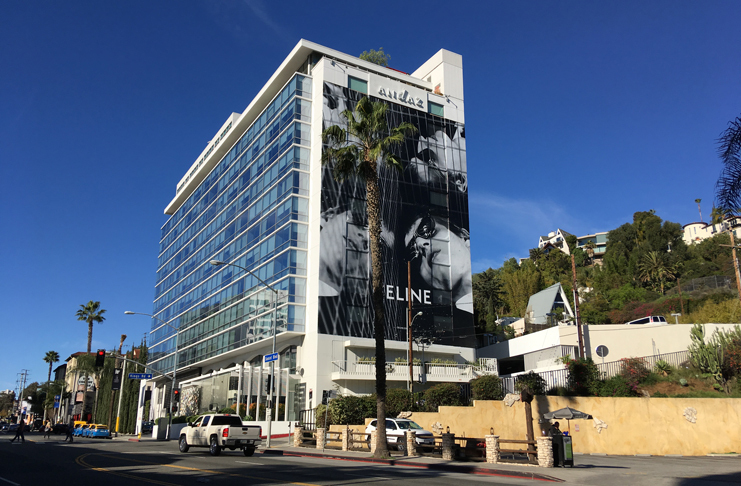 Yesterday I published a post in which I shone a spotlight on the Andaz West Hollywood as I pointed out that the property has started charging guests a ‘Destination Fee’ of $23.10 per night on top of whatever nightly rate is on offer. As usual the post got sent out on Twitter but this time I also specifically sent a tweet to the Andaz West Hollywood (with a link to the post) to see if I could get the property to address the points I made. As great as it was that the Andaz replied (and I am genuinely grateful the property took the time to reply) the response is nothing more than a smokescreen. As I pointed out yesterday, the Andaz West Hollywood is adding a $23.10 nightly surcharge to guest’s bills to cover things that an overwhelming majority of guests will neither want nor need. $10 off at the hotel’s restaurant/bar where a bowl of olives can set you back $9 isn’t a perk – it’s an attempt by the property to draw guests into spending more than they may otherwise have done on the premises….because how many guests are going to spend just $10 in the hotel’s restaurant once they’ve sat down? A $20 pass to ‘Cycle Bar’ may be useful to any guests who specifically want to use the facilities that Cycle Bar offers but it’s completely unnecessary for guests who are more than happy to use the Andaz’s perfectly adequate gym. Other ‘benefits’ like $3 off admission at the Grammy Museum (over 9 miles away), $25 off a massage at the Exhale Spa in Santa Monica (almost 12 miles away) and a 10% discount on select Star Line tours are both niche and easy to find via other channel that don’t cost $23.10. I don’t see anything here that will “enhance the overall guest experience”. Besides, as I pointed out to the Andaz in my reply, if this destination fee is genuinely a good thing for guests then…. Why aren’t its merits emblazoned all over the hotel’s homepage? Why is there no mention of the Destination Fee anywhere in the booking process until a guest specifically selects to see a breakdown of the costs which make up the final bill (which not all guests will do)? Why does it take a Google search to find details of the Andaz West Hollywood Destination Fee and why are details of the fee buried on the hotel’s ‘policies’ page whose link is both tiny and hidden right at the very bottom of a long homepage? Why aren’t the ‘benefits’ of the Destination Fee included alongside all the other real benefits the Andaz offers? The LA and West Hollywood scenes are both fantastic but there’s absolutely nothing here which will add to the majority of guests’ enjoyment of either and, if the Andaz really believed its own reply, details of what the Destination Fee offers would be obvious the moment a guest opened the homepage. The new Andaz West Hollywood Destination Fee is a stealth rate increase that has been introduced in a way which, intentionally or not (I’ll let you decide), will have the effect of deceiving a lot of people who use the popular price comparison sites. Online price comparison sites offer guests the ability to sort hotels search results in a number of different ways and a popular way to view these results is in order of cost. All of these prices that you’re being shown do not include taxes or hotel surcharges like ‘Destination Fees’. As most of the properties in any such search will probably be liable to charge the same rate of tax the fact that the taxes aren’t included doesn’t make much difference – if taxes were included the nightly rates would appear higher but the order in which the hotels would appear would not change. But this isn’t the effect that Destination Fees have and a good feature of Kayak’s website will allow me to illustrate what I mean. Now take a look at how a Destination Fee can warp a set of search results. When you search for hotels in West Hollywood (for a random date) and sort the results by ‘nightly base price’ starting with the most expensive first, the Andaz West Hollywood only just makes it on to my screen as the 8th most expensive property. Properties like the Palihouse appear to be more expensive. The Kayak feature which shows pricing with all fees included isn’t perfect because some properties (Like the London West Hollywood and the Kimpton La Peer above) simply disappear out of the search results when you choose to view the overall cost….but you can still see the effect of the destination fee on how the results are ordered. Sites like Hotels.com don’t offer the option to see hotel prices including all the surcharges so, unless travelers know what to look out for, it’s very easy for properties like the Andaz West Hollywood to make themselves appear to be cheaper than the competition when that may not actually be the case. Add to that the fact that the Destination Fee is so poorly displayed on the Hyatt website (and on the websites of most other hotels which add such egregious charges) that a lot of people may not even notice what they’re being billed for, and you’ll start to see why I think it’s time we see legislation to force hotels to bundle up these fees in their base nightly rates. Of coarse the response is nonsense. The fee is nonsense. As you said, just a money grab. Thank you for shining the light on this deceitful practice. Total BS. Call it what it is: fraud. Every grifter can try to rationalize their theft but it doesn’t excuse it. I would file a Complaint with the California Attorney General’s Consumer Fraud office. You just need to become a Globalist, as the fee is waived for Globalists. True, but that’s just a workaround for an issue that shouldn’t exist. As absurd as these fees are, hopefully it does motivate the booking decisions of even those who may not be aware. Hopefully, they are looking at the total price when comparing hotels. As you mention, the top-line prices are typically lowered when these fees are added, so ironically Globalists are actually obtaining a net discount as a result of these bs fees. Makes me happy! why do these comparison sites don’t show the full price incl EVERYTHING, by default? As soon as the Andaz responded to you and used the word “enhancement” that surely was a sign of authentic frontier gibberish. Run away! If the ‘destination fee’ is such a good deal for the guests, why isn’t it optional? It’s a deceptive money grab.